Seen at the pond near Newtonbrook Creek where it meets up with the East Don River, last weekend, posing nicely for the camera. It would swoop away, put on an aerial show over the water, then swoop back and patiently bask on a twig while I took photos–in some cases, from less than an inch away. I am easily pleased, so I thought this was pretty exciting. Apparently, this perching behaviour means it was likely a male. What I loved about it, besides its unnatural cooperation, was the jewel-like colour and sheen of the amber mid-section and the delicate traceries on the irredescent wings, and if you’re thinking that’s a lot of high-fallutin’ language for a bug, well, I don’t care. It’s beautiful. 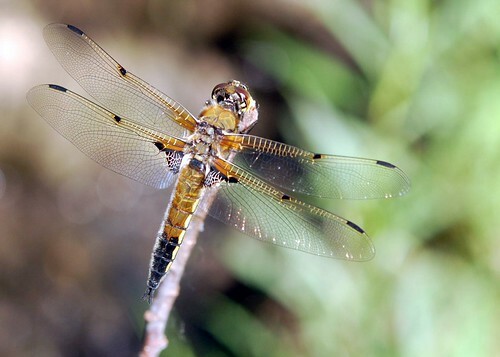 The four-spotted skimmer is the state insect of Alaska. I didn’t know that states had insects, but there you go. 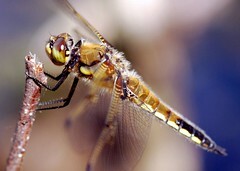 It’s a common dragonfly in Ontario, and lives near ponds and slow-moving streams. 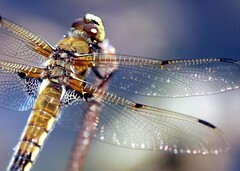 Since they don’t tolerate polluted water well, dragonflies are a good indicator of a healthy wetland. They’re carnivorous and eat other insects, particularly mosquitoes. they have survived nearly unchanged for over 300,000,000 years–before dinosaurs evolved. they can fly forwards and backwards and mate in mid-air by forming heart-shaped flying wheels. Apparently dragonflies have not been a cool topic of science research for the past few decades because Google Scholar had almost nothing to tell me about them. Poo, I say. Clearly I will have to get myself a field guide or a research book or two to answer questions such as, how did their development evolve? That long slog in the pond eating everything that comes by, only to wander out on dry land and split in half to emerge as a flying insect. Where did that come from? Not that it matters, I suppose, considering how beautiful they are, and given that they seem likely to last another 300,000,000 million years, outliving by far whatever disasters we may throw at the planet in our own short tenure. That is stunning. Excellent photography, and an exquisite subject. Any buggy who eats mosquitoes is a buggy of mine.